Understanding how the brain learns to recognize objects is one of the ultimate goals in the cognitive sciences. To date, however, we have not yet characterized the environmental factors that cause object recognition to emerge in the newborn brain. Here, I present the results of a high-throughput controlled-rearing experiment that examined whether the development of object recognition requires experience with temporally smooth visual objects. When newborn chicks (Gallus gallus) were raised with virtual objects that moved smoothly over time, the chicks developed accurate color recognition, shape recognition, and color-shape binding abilities. 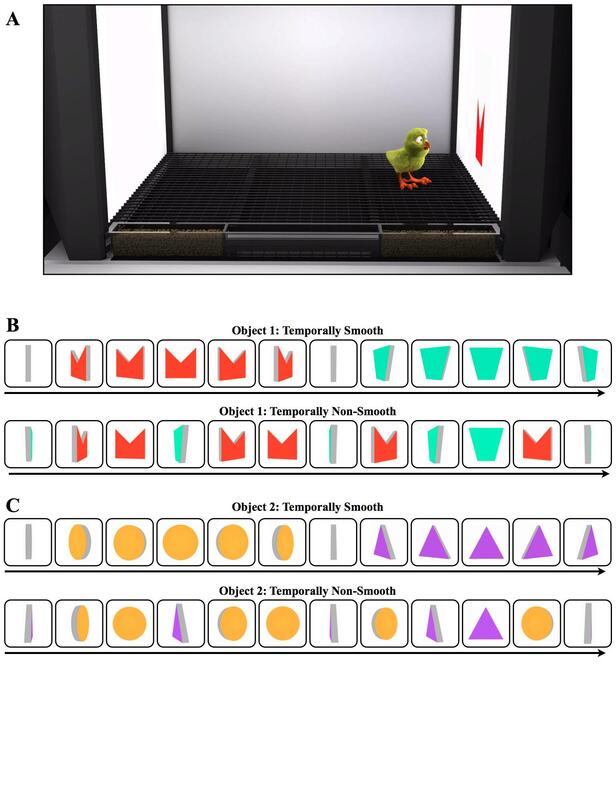 In contrast, when newborn chicks were raised with virtual objects that moved non-smoothly over time, the chicks’ object recognition abilities were severely impaired. These results provide evidence for a ‘‘smoothness constraint” on newborn object recognition. Experience with temporally smooth objects facilitates the development of object recognition. (A) Illustration of a controlled-rearing chamber. The chambers contained no real-world objects. To present object stimuli to the chicks, virtual objects were projected on two display walls situated on opposite sides of the chamber. During the input phase (1st week of life), newborn chicks were exposed to a single virtual object that either moved smoothly or non-smoothly over time. Half of the chicks were raised with the object shown in panel (B) and half of the chicks were raised with the object shown in panel (C). Results from the test phase. The bar graph shows the mean proportion of time spent by the imprinted object compared to the unfamiliar object for each test trial type. Error bars denote ±1 SE. Chance performance (dashed line) was 50%.